Our practice, Mason Cosmetic & Family Dentistry, offers family dentistry, general dentistry and many cosmetic dental services. If you have a family and are looking for a family dentist, give us a call at 817-481-4717. If you live in the Grapevine area, it is wise to choose a local dentist for your family dentist. It will be easier and more convenient for every member of your family to come in for regular examinations and cleanings. Most busy parents don’t need the additional hassle of a long commute to a dental appointment. And what if you experience a dental emergency? 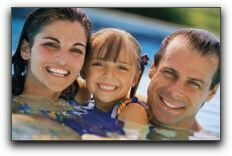 A local dentist who knows your family is best equipped to handle an unforeseen dental need. In addition to basic preventative dental health services such as fluoride treatments, routine x-rays and oral hygiene, we offer implant restorations, implant-supported dentures, and periodontal disease treatment. You can reach Mason Cosmetic & Family Dentistry at 817-481-4717. Parents with infants and toddlers often seek about thumb-sucking, the health of baby teeth, x-ray safety, and fluoride supplements. Parents with older children are often concerned with sealants, tooth protection for sports, tooth straightening, and dental financing.